We are so excited that you want to learn new things and we're here to help! If you see a class you are interested in simply click the name for more information. We add classes to our schedule all the time make sure to check our website for the most current information. We are implementing a new system to indicate the difficulty or a class. Each class includes a school themed indicator as to its difficulty. Pre-K Classes(PK) are designed for individuals who have never sewn before. 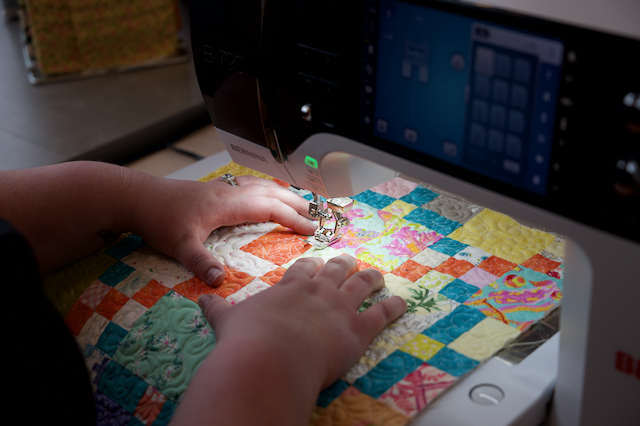 Grade School(G) Classes are beginner classes designed for those familiar with basic sewing and quilting techniques. Middle School(M) classes are intermediate level classes designed for individuals who have taken a beginner class in the subject or are comfortably familiar with the technique. High school(H) classes are advanced classes for those who have taken intermediate level classes in the subject or have significant knowledge of the technique. Lastly College (C) classes are our expert level classes designed for those individuals who have mastered all the previous levels and want to really challenge themselves. 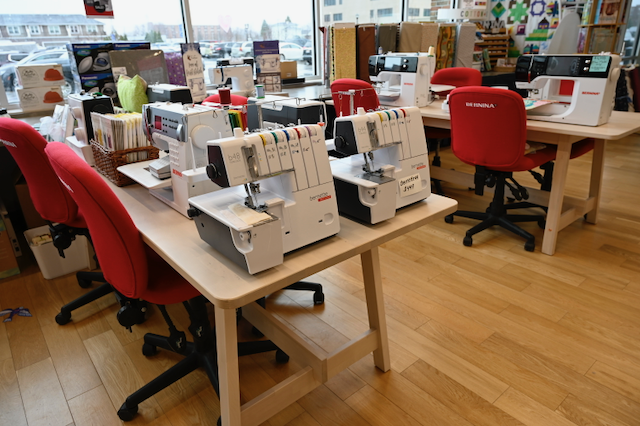 Each class includes the use of a Bernina, Bernette, or Eversewn sewing machine. You are however more than welcome to bring your own machine. 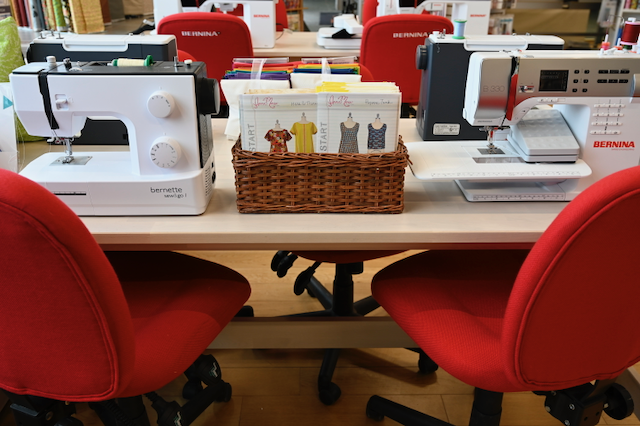 You will also be provided with some basic tools such as pins, a seam ripper, rotary cutter and small cutting mat. There may be special tools you need for a class and those will not be provided, but will be stocked for purchase at a 10% discount with class registration. 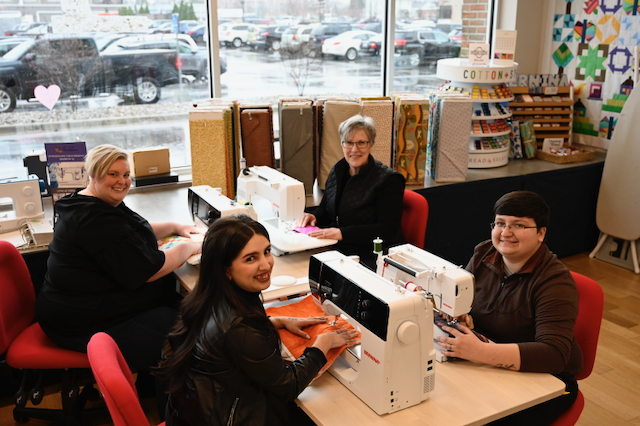 Should you not complete your project we will offer discounted open sew time at $5/day this is simply time to spend with fellow sewists and use our machines we will not provide additional instruction at this time. Should you feel you need additional instruction you may sign up for a private lesson with your instructor at a discounted rate of $15/hour. All classes must be paid for prior to the start of class. All class supply purchases will receive a 10% discount. Refunds will be given on a case by case basis though they typically are not given as we take extra time to bring in supplies specifically for your class and provide our instructors with fair wages. We reserve the right to cancel a class for any reason. Stop in or give us a call to sign up today! Perfect for those wanting to learn all the basics of quilting. We will teach you how to perfectly slice, dice, and sew it all back together to make this adorable crib size quilt (can be made larger). Learn to accurately place machine embroidery motifs within a variety of different block sizes and perfect your piecework skills. Become an appliqu? wiz and make a cuddly, comfy, playmat perfect for the little one in your life! You'll perfect your appliqu? skills, learn to accurately piece triangles, and make stuffies for entertainment. $50, supplies must be purchased separately. Join us for a day of collage techniques. This class focuses on the techniques developed by Laura Heine and is designed for those who have completed an introductory level class in this technique. We highly recommend a kit, sirene kit cost $175 and seawell kit cost is $110 these kits can be ordered through our store up to 2 weeks before the class date. Make a beautiful set of essentials perfect for everyday use or a special trip. You will learn to make the Wool+ Wax Tote, Minimalist Wallet, and Petal Pouch. Make one for $30, two for $50, make all 3 for $75. July 12th(tote), 19th(wallet), and 26th(pouch). 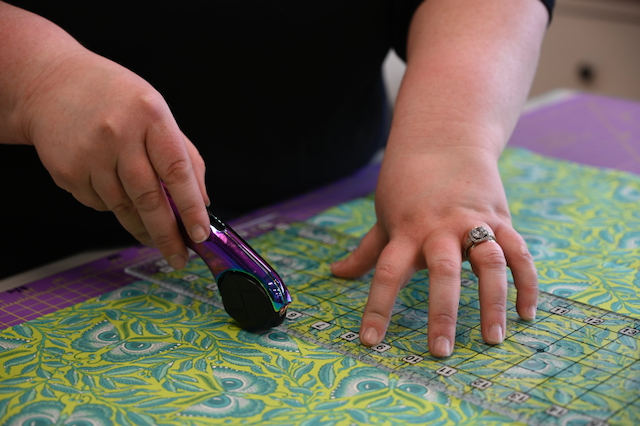 Perfect your paper piecing skills, learn to piece on the bias, and how to cut with templates. Join us for an afternoon of collage techniques. This class focuses on the techniques developed by Laura Heine and is designed for those new to the technique. We highly recommend a kit, kits cost $62 and can be ordered through our store up to 2 weeks before the class date.